Work smarter. Get paid faster! We understand that "customers" come in all sizes and have their own paying terms. Some may want role based rates, some a default hourly rate or a pre-fixed sum. So you can serve them all with Orangescrum Invoice Pro in "155 Currencies" with flexi rates as per your agreement. Have daily, weekly, monthly, quarterly billing cycle? Do it all with ease! Set easy recurrence for your invoices and have them automatically delivered to your Client's inboxes. With customized invoicing with Orangescrum you don't have to miss a cycle ever! 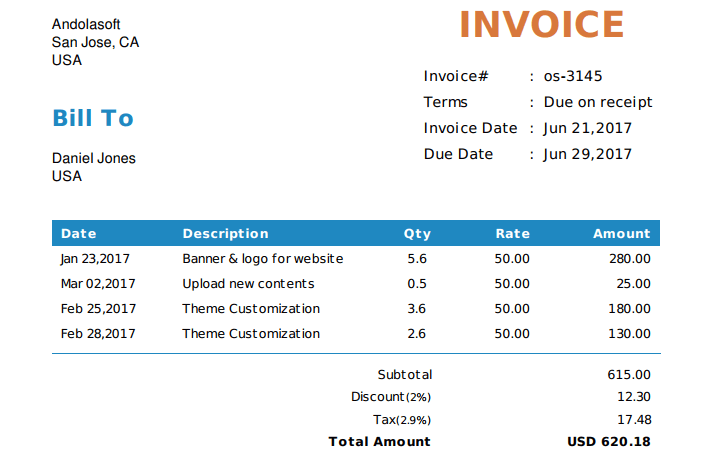 Send your clients Professional invoices with your branding and logo. Have pre-defined custom message, taxation and bank info. Save your teams 1000s of hours from retyping the same info a zillion times! Define roles for your projects and assign hourly rates to each role. Create your customers and map them to the project. Easily mark your billable and non-billable hours. Generate professional invoices with a few clicks. Auto-generate invoices upon task closure. Send invoices directly from Orangescrum as PDFs. Charge your true worth, Gain customer confidence and Build long term businesses!